Sisters residents get used to seeing all sorts of interesting sights as the summer crowds descend upon the town. One that will become familiar even after those crowds leave is the dog cart pulled by Sherlei (pronounced Shirley) Lestarjette's enthusiastic pair of rescued dogs. Tramp and Lady. Both are 18-month-old black Lab-cross pups from the Redmond Humane Society. They can be seen most days by those who savor the early morning and evening sights and sounds west of Sisters. 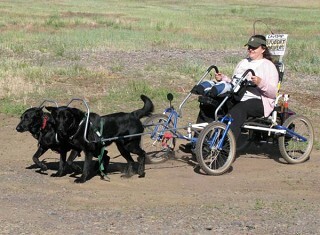 Lestarjette uses the cart to harness the energy of her young dogs, providing them with an outlet for their exuberance and her with a means of transport and fun. "The dogs would rather pull the cart than walk on a leash," she said. "They can choose their own pace." That pace can get pretty thrilling at times, as the pair learns that squirrels aren't to be chased. Lestarjette has had the dogs training together just a few weeks, and while their demeanor is one of calm obedience, natural instinct is hard to channel. They respond willingly to her commands, so it's up to Lestarjette to be observant and spot potential bolts. She does ask that drivers be aware of the dogs' potential for distraction, and to pass them carefully. A "Caution, Student Driver" sign on the cart serves as a humorous warning that the unexpected could occur. Sometimes other dogs become bothered by the sight of the approaching cart. Lestarjette carries a whip for protection, just in case those dogs are either off-leash or unable to be controlled by their owners. Lestarjette's life has always included canines. "I've always had a way with dogs," she said. Watching the way Tramp and Lady follow her every movement is evidence of a swiftly forming bond. "An exercised dog is a happy, well-behaved dog," she said. Several years ago, Lestarjette suffered a stroke and ended up in a wheelchair for 18 months. She is once again mobile, but finds that her balance isn't what it used to be. Strenuous physical activity is difficult and she wanted to find an activity that would allow the dogs to exercise and her to stay close by to supervise. A fascination with dog sledding led her to think about ways to incorporate the ability of dogs to pull with finding a safe object to be pulled. She put an ad on Craigslist, asking for a dog harness, and got a reply from professional dog musher Karen Yeargain in Prineville. Yeargain taught Lestarjette the finer points of training dogs to work in harness, and eventually mentioned that she had a cart she was willing to part with. The cart is a Sacco, manufactured in Norway. Due to the high cost of shipping, new Sacco carts are no longer available in the U.S. They are designed to cover all sorts of terrain, from smooth bike paths to rocky streambeds. Lestarjette hasn't put hers to the test yet on very rugged ground but is confident that her dogs will handle that in time. Until then, they'll cover the ground along the McKenzie Highway and surrounding forest roads with Lestarjette hoping the squirrels keep to themselves. I loved this story there are many handicapped people that use the dog cart. I would like to add that Sacco Dog Carts are available right here in the USA and are now made in the USA as well the website is http://dogcartusa.com This comment has been hidden due to low approval. Shirlei and her dogs are a wonderful example of combining the needs of animal and human in a way that benefits both... and, they are a joy to work with as mushing students! www.tumnatkisiberians.com This comment has been hidden due to low approval.